Soccer has come a long way in the last decade and become a global phenomenon, taking an even deeper root in American sports. With the rise in popularity however, has come an equal rise in the amount of equipment available in the US. Finding the right cleats, pads and other protection has become a more and more difficult task, as has become finding the right ball. There are a great number of soccer balls to choose from, made of any number of different materials that make them ideal for either indoor or outdoor use and come in at vastly different price points. Soccer balls range from the traditional black and white diamond pattern to more modern swirl designs in a variety of colors. Sizes range from 3 to 5, with size recommendations based on age. Choosing the right ball for your needs can be a difficult decision. Here are some of the top rated soccer balls for 2017, with a list of various features as well as their pros and cons. Hopefully, this soccer ball review will help you navigate the mind-boggling variety of soccer balls to choose from to help you find just the right ball for your individual needs. 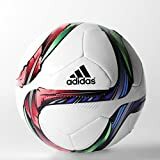 Adidas Performance Conext15 Glider Soccer Ball – The Conext15 Glider ball is a great training ball, perfect for a wide variety of different surfaces. It comes in 6 different color combinations, including a green, a gold, a red and a cyan base with graphics modeled after the design on the 2015 FIFA Women’s World Cup Official Match Ball. The machine stitched design creates enhanced durability and a softer touch. It contains a butyl bladder, which is the best for air retention and is 100% TPU butylene injection molded. It comes in three sizes, 3, 4, and 5. Adidas Performance Messi Soccer Ball – The Adidas Performance Messi Soccer Ball is part of the Lionel Messi Soccer Collection and comes in three different color combinations with a black base, an orange base and a white and red base. Available sizes are 1, 3, 4 and 5. The machine stitched construction ensures a soft touch as well as high durability and makes it an excellent choice for play on a number of different surfaces. The butyl bladder provides for excellent air retention which helps it stay inflated longer. Balls range in price depending on the size you purchase. 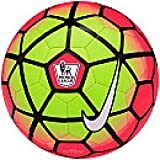 Nike Pitch Premier League Ball – The Nike Pitch Premier League Ball comes with three different styles of high resolution graphics which were modeled after the Ordem III Match Ball. It comes in blue and white. white and crimson and crimson and green. It ships deflated, so just be aware you will have to inflate it yourself. It’s traditional 32 Panel design allows for durability and strong play. It features a machine-stitched TPU casing for consistent play and a reinforced rubber bladder for enhanced shape retention and comes with a manufacturer’s 2 year warrantee on the stitching and shape. 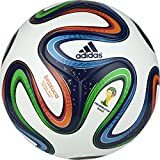 Adidas Performance Brazuca Top Replique Soccer Ball – The Adidas Performance Brazuca Top Replique Soccer Ball is designed based on the 2014 FIFA World Cup. The vibrant colors on the ball reflect those of the Brazilian flag as well as the official logo of the FIFA World Cup. It offers a seamless surface, thanks to thermal bonding, which provides for a better touch, a more predictable flight path and lower water uptake. This ball had passed rigorous FIFA tests conducted on circumference, weight, rebound and water absorption and uses high quality materials that are perfect for higher level training. 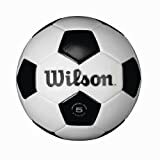 Wilson Traditional Soccer Ball – The Wilson Traditional Soccer Ball is perfect for old school traditional soccer ball lovers and younger players just learning the game. It’s traditional 32 panel black and white design has been the basic staple of soccer balls for generations, but subtle silver accents provide a modern twist. Made of machine sewn synthetic leather with a butyl bladder, this ball is made for durability and long lasting play. The ball varies in price depending on what size you choose to purchase. Whether you are a brand new soccer player or a more experienced player, there is a ball that is just right for you. Traditional balls with the 32 panel design are great balls for budding soccer players to start with, as the panels slow the roll of the ball, which allows for easier contact with the ball and greater control. As soccer players mature and develop greater skills, a seamless ball will allow them a faster play with more aggressive maneuvering. Different sizes help to not only provide a better fit for different ages, but also provide a better fit for boys or for girls past a certain age. A size 3 ball is recommended for players under the age of 8, while a size 4 is recommended for players between the ages of 8 and 12 and a size 5 – which is the official size – is recommended for ages 12 and over. How you use the ball will also help determine which is the right ball for you. For outdoor play for younger players, particularly in wet or muddy conditions, and heavy use, a machine stitched synthetic ball such as the Wilson Traditional ball with a butyl bladder will provide for the most durability and the best longevity. For game play and more highly skilled players, a match ball such as the Adidas Performance Brazuca Top Replique ball will provide the best experience with a ball closest to that used by professionals. Training balls, such as the Adidas Performance Conext15 Glider Soccer Ball will provide a good blend of match level characteristics with the durability of an outdoor ball. These balls are the best all-around balls, but for turf specific or indoor play, there are also a number of balls made specifically for play in those conditions.